USA.rs.312.qxxs.A surprising amount of the lab's work at Robert Full's Poly-PEDAL laboratory at UC Berkeley (California) focuses on cockroaches, because they are exceptionally mobile?for their size, the fastest species on the planet. The fastest roach is a big species known, melodramatically, as the death-head roach, seen here in its "run" at the Poly-PEDAL lab. 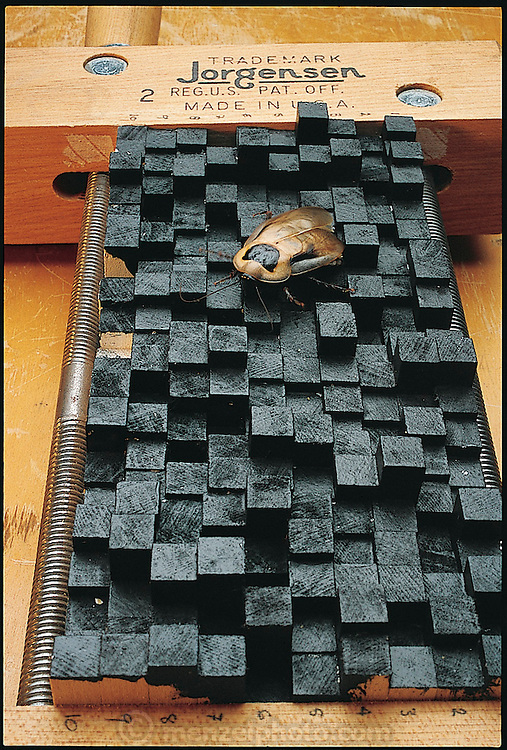 As the run demonstrates, cockroaches do not have to have secure footing to move quickly. Instead, they use two alternating sets of legs (two on one side, one on the other) as springs, almost bouncing themselves forward. Remarkably, the insect brain doesn't have to see its feet or even be aware of them. From the book Robo sapiens: Evolution of a New Species, page 96.